The first computer I owned was an Atari 800. While this was not the first machine I worked on (in 7th grade I was using a TRS-80 from Radio Shack to program in Basic and was using an Apple // at a neighbor’s house to play Space Invaders), it was the first machine I had at home every day after school and all summer long! Here is a photo of what this beast looked like. 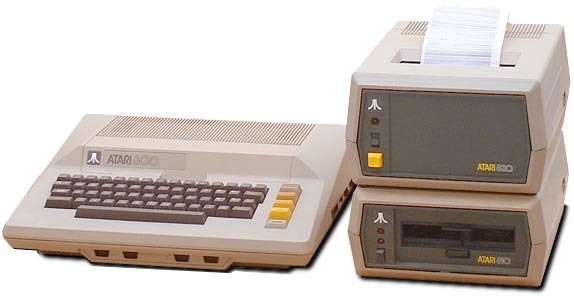 I had the main unit with keyboard, a couple language cartridges and two of the Atari 810 floppy disk drive units. I didn’t have the printer shown in the picture. In order to program this computer I used the BASIC Programming Language. This was loaded into the computer by inserting a ROM cartridge. The concept of a disk operating system was somewhat limited in those days. If you wanted to move files around on the floppy disks you didn’t have many options. Of course, this meant there was a golden opportunity for someone to create an application to address this shortcoming! Shareware was all the rage back then so a friend and I set out to build an application that would help with disk management. Of course, back in those days there was no Internet, no concept of registering your domain name, or any notion of taking payments via PayPal. Nope, in those days you had modems and buliten board systems. People ran file BBS nodes using something called FidoNet. Some people had more than one dial-in phone line for their BBS systems. Most only had one phone line, and some had to shut down their BBS systems when they wanted to make phone calls. Our plan was to build the application and upload it to FidoNet. People would get to use it for free, and if they liked it they would mail us a check for a few dollars. (Yes — using the postal service, a stamp, and a real paper check.) The application was called Disk Master and the company we founded was called Seaview Software. I don’t have a copy of the software anylonger but did run across a copy of the documentation for our first release.